For homeowners with lush-lawn dreams but a dirt-patch reality, there's a lot to like about sod. Only bear in mind that for sod to survive and thrive long term, the soil beneath often requires special preparation. Here's what to know. 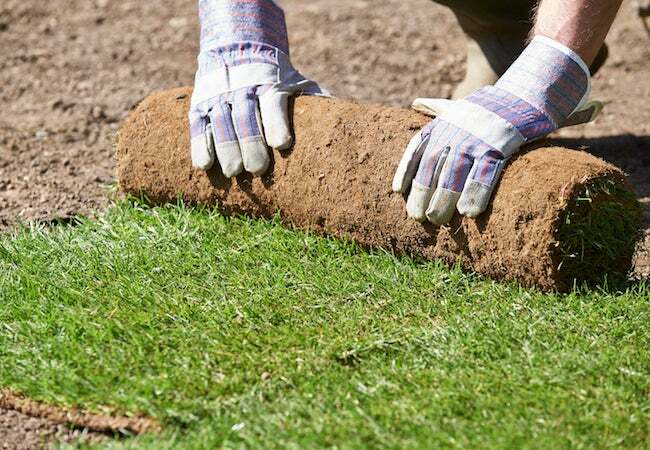 Laying sod isn’t a trivial, low-effort project, but careful preparation makes the job a whole lot easier and significantly increases your chances of success. Most importantly, there’s the question of timing. Over the course of the year, which seasons are the best for laying sod? Mostly, that depends on your locale. If you live in a northern climate, focus on fall or spring. If you live in the South, do it in the spring. Even before you get the sod delivered, you’ll want to level your land as much as possible. Although you’ll likely need a landscape contractor to address extremely uneven terrain, you can do much of the smaller work yourself. During the prep phase, it’s also wise to test your soil. That way, you’ll know if fertilizer, lime, or any other soil conditioners may be needed to make the ground hospitable to the sod you plan to lay. Last but not least, it’s important to aerate the soil with a garden fork or the tool of your choice. Along the way, keep an eye out out for buried rocks and compacted clumps of earth. These must be removed for the sod to root properly. To make sure you didn’t miss any spots, use a hose to wet down the prepped area. Any puddles that form will tip you off to any areas that are in need of more attention.